On Oct. 15, 1972, then U.S. Air Force 1st Lt. William Diehl accomplished something that few aviators who flew over Vietnam can lay claim to -- he bagged a MiG. "We were flying and then all of a sudden a MiG just flew by," said now Col. William Diehl. "We shot him down. It was, for the most part, luck." Diehl was a weapons system officer flying in the back of an F-4E "Phantom II" as part of a major air campaign -- Operation Linebacker II. The operation designed to bring the North Vietnamese to the Paris peace tables. The fighter team had a simple assignment on paper but maybe not in reality -- protect the bombers flying north. "We had already engaged twice earlier that day with our AIM-7s (radar guided missiles) and they went wild -- didn't hit anything," said Diehl, who was flying with the 34th Tactical Fighter Wing at the time, "and we were down to two heat seeking AIM-9s. I fired those off and the MiG tumbled down in flames." There is skill and there is luck. In combat, the latter sometimes is more important than the former. Diehl agrees with the statement. He feels luck played a major part in his bagging a MiG-21. "If the truth be known, I'd venture to guess about 90 percent of all air-to-air kills are luck," said Diehl. "Not a lot of people like to think about it that way, but I believe it to be true. But then again luck or not a kill is a kill and we took it." "The case was pretty much that with our situation with the MiG," he said. "We heard there was another MiG down and there was a chute in the air. It turned out to be this guy's leader." The MiG Diehl would eventually blow out of the sky was flying a circle over where the enemy pilot's leader had ejected. The other MiG was trailing the same spot in the hopes of marking his spot so the leader could be recovered. "I looked up at the right moment and spotted him," said Diehl, a veteran of 172 combat missions over Southeast Asia. "There he was orbiting around a spot, and we bagged him." Diehl never found out if the MiG pilot made it out alive. "The intelligence guys could never tell us. He was last seen falling from the sky in flames, and we were basically the last guys in and out of there; so we didn't hang around too long looking for him." Due to politics and poor planning the Vietnam war didn't produce too many MiG kills for U.S. pilots, and add to that the fact that the coveted title of Ace -- five kills or more -- was very hard to come by morale was low in many fighter units. The USAF produced just three aces from that war; then it becomes evident that even one kill is a pretty special event for a young aviator. "It was kind of a joke in our unit because we had been in position about three other times to do the same thing and has lost out," Diehl said. "But the real accomplishment was chasing off the enemy to protect the bombers. A kill is good, too, but our job was protection." Almost 20 years later, Diehl found himself in another war, and this time it was a different story _ the politics that had brought about the losing dogma of the Vietnam war had been replaced with a killer spirit to win in the Persian Gulf. 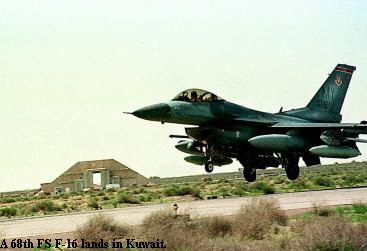 Saddam Hussein invaded Kuwait on Aug. 2, 1990. One week later as squadron commander of the 17th Tactical Fighter Squadron, Diehl landed one of the first USAF units to participate in Operation Desert Shield in Saudi Arabia. "We were the first air-to-ground unit there on the ground," he said. When the decision was made that coalition forces were going to kick Hussein's forces out of Kuwait, Diehl and most American military members in the Saudi Arabian desert began an almost monastic life that like the priesthood had but a single purpose -- preparation for a higher calling. "We took five months to practice what would become the first raid on Baghdad," said Diehl, who flew 40 combat missions during the Gulf War. "We were given the luxury of practicing that mission 18 times in the five months." Diehl said secrecy around the mission was so tight that only 12 people knew what the training missions were ultimately for. "We all met in a vault to insure secrecy," he said. "And they wanted to keep it very tight, but I insisted I needed some people to help me plan the thing." The practice paid off. Diehl lead a flight package of 32 aircraft many carrying 2,000 pound bombs to strike an important airfield outside of Baghdad. The tension on that first mission was high, he said. "In the days and weeks leading up that first mission we thought there was going to be a beehive of enemy air activity defending Iraqi airspace," Diehl said. "Right as we crossed the border there were two MiG-29s thrown up against us, and the F-15s blew those away. After that we didn't see any more fighters." The fighters might have been gone, but the anti-aircraft artillery was there to stay, Diehl said. "It was a real show the amount of triple-a they threw up at us. They launched some SAMs (surface-to-air-missiles), too, but they all went wild. 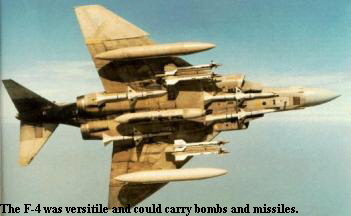 The missile operators were afraid our F-4G `Wild Weasels' would nail them with HARM anti-radiation missiles; (the F-4 pilots) were flinging those all over the place, and so the Iraqi operators shut their radars down," Diehl said. "It was intense, and they guys who came through last said the smoke and the triple-a was so bad they had a hard time seeing the target. It was a very intense time. In some ways that first mission over Baghdad was more intense and dramatic than anything I saw over Hanoi." The world was watching the light show, too, Diehl said. "The funny thing was that as we were attacking, Peter Arnett was on CNN telling people that an attack was happening," he said. "And our guys back at base were all looking at their watches saying `They are on time.'" The training of two decades paid off in the Iraqi sky that day. The mission was to shut the airbase down for a day by cratering the taxiways and the runways, Diehl said. "We managed to shut it down for about two-and-a-half days," he said. The victory was a real boost for morale within the squadron, Diehl said. "It was after that morale soared," he said. "People saw that we could do it, and we settled in to doing our job during the war. After that, we never lost a pilot in my squadron."